Every year, the American Institute of Steel Construction (AISC) hosts NASCC: The Steel Conference, a three-day event for structural engineers, fabricators, detailers, educators, and others involved in design and construction. It is an excellent opportunity to network with peers and discover cutting-edge technology and methodologies from the exhibitors. 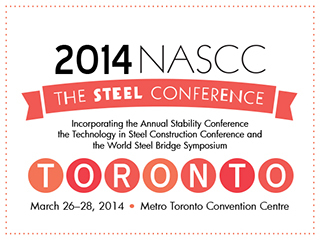 There's an overabundance of topics and more than 100 sessions for anyone associated with the steel industry. With over 30 years experience in steel fabrication and our software, our knowledgeable team is pleased to have the opportunity to showcase STRUMIS – Management Information System for Steel Fabricators at NASCC. Drop by and visit us on booth #1611 to see one of our live software demonstrations. We will show all visitors to our stand, involved in steelwork fabrication and construction, how using our products could result in delivering efficiencies and increased productivity! This one is on us. So click here to claim your free one day pass. STRUMIS is a complete steel fabrication management information system that harnesses the information flow and work processes through departments, suppliers and clients; from estimates, through procurement and production into construction. As part of the new STRUMIS V9 release, we will showcase the highly popular feature Production Planning and Scheduling - allowing users to profitably and effectively manage projects from every aspect. STRUMIS now has ‘True BIM Links’ to modeling packages, providing real-time status and attribute data directly within the model itself! The workflow starts with the efficient migration of dedicated geometric and attribute data, the BIMReview exports allowing BOM’s and details to be imported swiftly into STRUMIS. Simply attend this seminar at the time and date mentioned above or visit our booth (#1161) for more details. Invest in Technology for Competitive Advantage! Invest in STRUMIS technology for your steel fabrication business and enhance core competencies to gain competitive advantage. Fabricators from coast to coast use STRUMIS' advanced steel fabrication management software to efficiently run their operations. Our products are compatible with CNC equipment and all major CAD packages. With STRUMIS, you can connect your business resources and obtain time, cost and process savings for greater efficiencies, traceability and productivity leading to increased profitability. We welcome any delegate registered/attending NASCC to drop by and see us, where our sales representatives will be more than happy to demonstrate our structural steel fabrication management solutions.